• Equities Edge Higher Last Week. Stocks ended lightly mixed on Friday, paring modest weekly gains, as oil prices slumped the most in nearly a year after a Saudi Arabia oil minister said increased production will likely raise global crude oil supplies in the second half of the year. • Overall Modest Gains. For the week, the S&P 500 gained 0.33%, the Dow Industrials rose 0.15%, and the tech-heavy Nasdaq Composite advanced 1.09%. Small cap stocks, which have outperformed relative to the S&P 500 for the past month, trailed last week, with the Russell 2000 Index up just 0.03%. • Energy Companies Retreat. With oil prices down the most since last June, energy companies (-4.54%) fell the most last week among the 11 major sectors groups. Materials (-1.43%) and Financials (-0.38%) also led to the downside, while Utilities (+3.11%), Real Estate (+2.04%) and Technology (+1.32%) gained the most. • Key Economic Data. April new home sales fell less-than-expected (-1.5% vs. -2.1%), as a 7-year high in mortgage rates and elevated home prices prompted at least some potential buyers to hold off. Sales fell only in the West (-7.9%). April orders for durable goods fell 1.7% as demand for transportation equipment sank 6.1%, but new orders for key capital goods increased more than expected, suggesting a revival in business spending after a weak first quarter. • 10-Year Treasurys End Below 3%. The U.S. Dollar Index ended at the highest level this year, while gold and Treasurys rallied, sending the yield on 10-year notes down 12.5 basis points at 2.932%. West Texas Intermediate oil fell 4.89% to end the week at $67.88/barrel. Higher interest rates are providing a boost to savers, and that will continue to improve as the Fed reduces its accommodative policy. Borrowers, on the other hand, are dealing with higher financing costs. Within the housing market, there has been a sizeable jump in the 30-year fixed mortgage rate, which has risen from 3.8% last summer to a 7-year high of 4.6% at present. While mortgage rates are trending higher, they are only back to 2011 levels, and still lower than their 25-year average of 5.9%. The housing market has been improving at a very slow pace this expansion and the current pace of new home construction starts is still close to what we have seen in the early expansion of prior economic recoveries. The lack of supply, an improving labor market, and still historically low borrowing costs have pushed housing prices above the 2006 peak in several markets. Despite the recent rise in mortgage rates, we do not anticipate a major slowdown in the housing market. Higher borrowing costs and a reduction in tax benefits for homeowners may lead to more meager housing price gains, but there is still strong demand for housing. Meanwhile, the economy remains healthy and millennials, the largest demographic in the U.S., are approaching their peak household formation years. Moreover, the current 30-year mortgage rate is still low by historical standards. 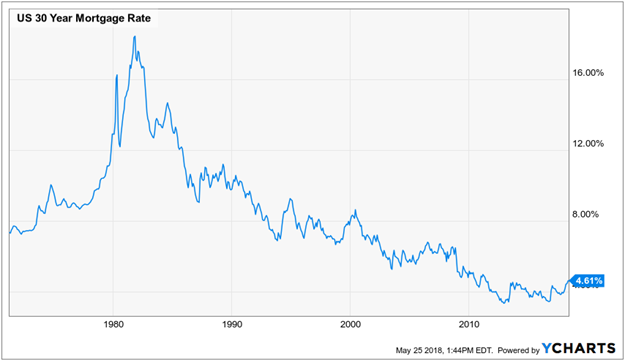 The average mortgage rate over the last 25 years is 5.9%; it was 6.6% in the 10 years leading up to the financial crisis, and 4.1% in the current expansion.